Choose your ideal holiday accommodation on Paros and Antiparos Islands, Greece, from over 100 choices of holiday rentals, and book directly with the owners. Find here information on how to reach our islands: schedules of Athens-Paros flights, Greek islands ferries and high-speed boats, ferries from Italy to Greece and boat connections to Antiparos. Also, Paros bus itineraries & local travel agents. What's on Paros & Antiparos? You can also subscribe to the weekly Paros Events Newsletter to be reminded of the upcoming events. You can unsubscribe easily when you stop being interested. Are you planning what to do during your vacation on Paros & Antiparos? Are you looking for lessons and workshops throughout the year? There is plenty of choice for outdoors & indoors activities of all kinds! Going out on Paros & Antiparos? Choose among a variety of restaurants with international and Greek Cuisine, all-day cafe bars, nightclubs, some operating in the summer and others all year-round. 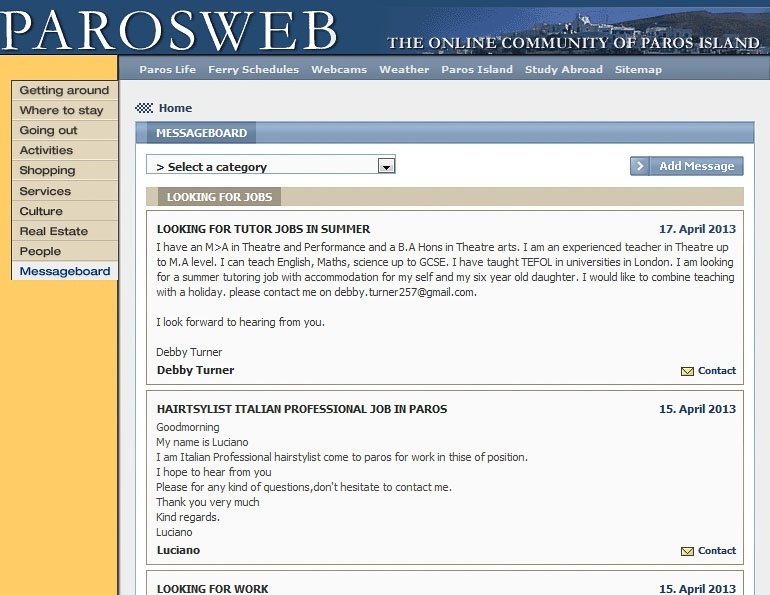 The Parosweb Messageboard is an old favourite! Free classifieds for job offers on Paros & Antiparos, information, lessons, looking for people from Paros & Antiparos and more. Ads are reviewed by Parosweb administrators before posting online. Job Offers 2nd-Hand Sales General Post a Free Ad! The island of Antiparos, accessed by boat from Paros, is a charming, small island with beautiful beaches, gentle landscape, a picturesque village and intense nightlife. A favourite of Holywood stars and other famous personalities. 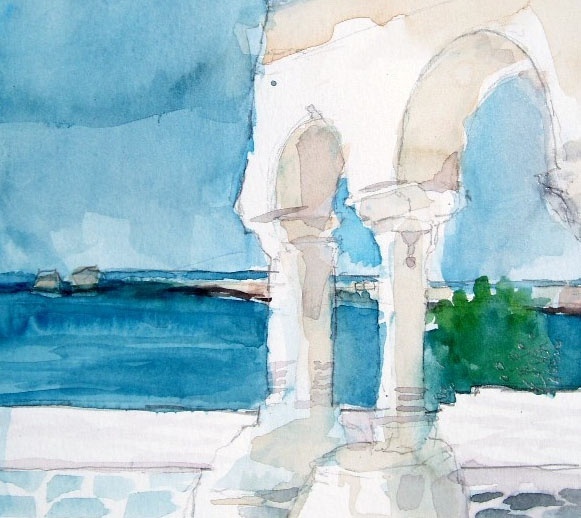 Many artists & craftsmen live and create on Paros & Antiparos inspired by the Cycladic scenery. The distinctive architecture, countless churches, monasteries, archaeological sites & museums immerse visitors into the local culture. Parosweb is not only a directory. We also create beautiful websites for all sorts of activities. And we manage corporate presence and reputation in social media. We are not only global experts in web and marketing services, but also knowledgeable in the Cycladic reality. PAWS has been a game changer for animal welfare on Paros for the last 20 years! Now it's nearly ready to take it to another level with a proper shelter for dogs and cats in Marathi. A crowdfunding is launched to help PAWS raise €40.000. Consider helping! Car rentals on Paros range from small to mini-vans; automatic and manual models available. You can also choose to rent a motorbike, a 4-wheeler or a bicycle or even charter a sailing boat or yacht. Paros & Antiparos, with a loyal list of returning visitors, boast a large foreign community. The quality of life here and the inspiration are almost magical! Real Estate on Paros & Antiparos is a good value for pleasure or investment. Paros Park is a peninsula of authentic Cycladic setting with impressive rock formations, caves, hidden coves, and beaches with crystal clear waters. It's home of the “Festival at the Park”, a summer cultural, sports, and environmental festivities. Places to visit at the East Coast of Paros: The picturesque Marpissa. The fishing hamlet of Pisso Livadi. The Blue Flag beach of Logaras. The famous Golden Beach and its water sports centers. The charming seaside Drios village. Directory of cafés, restaurants, bars & nightclubs. Choose now one of the car & bike rental services on Paros.